A long time ago I mentioned mp3check, and we also saw mpck and mp3val. 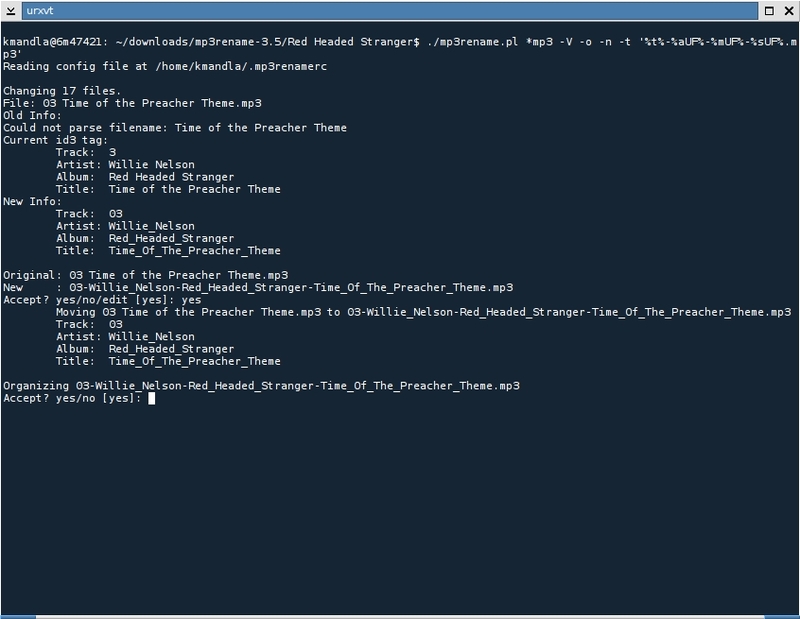 checkmp3 does much the same thing as those tools, albeit with a little less … discussion. checkmp3 adds on the oblique ability to “fix” mp3 files, by sending the entire file to STDOUT but omitting frames which appear invalid. I suppose that could technically “fix” an mp3 if you pipe it into another file, but I also suspect it would cause hiccups in some cases. The files I used for a test run were more or less intact, so I didn’t notice any difference in playback. That’s about all I can think of to say. It’s a very straightforward tool and (apparently) does what it promises. Let’s move on. This entry was posted in Linux and tagged audio, check, file, mp3, music on 2014/10/04 by K.Mandla. Somehow I managed to work my way through 20 months of console programs — usually on a two-a-day basis — and still not mention lame. It might be presumptuous for me to offer suggestions on how to use a program that has been around since 1998 and reached such a widespread audience. It’s even more presumptuous because lame has help pages as long as your arm, covering everything from variable bitrate encoding to filter cutoffs to id3 tagging options. For any tweak I could offer, lame has about 20 variations. I will be honest and say I don’t use lame much any more, since most tools I see incorporate other encoding tools, or rip straight from audio to mp3/ogg. It’s rare that I see a wav file that needs conversion. 😦 And if I must be absolutely candid, I haven’t ripped a CD to mp3 in years. Perhaps that too is a sign of our evolution, over the last 15 years. This entry was posted in Linux and tagged audio, cd, encode, file, mp3, music on 2014/08/13 by K.Mandla. Having already cruised past such heavyweights as mplayer, mencoder, handbrake, avidemux, inkscape and imagemagick makes me a little more comfortable approaching mpgtx. 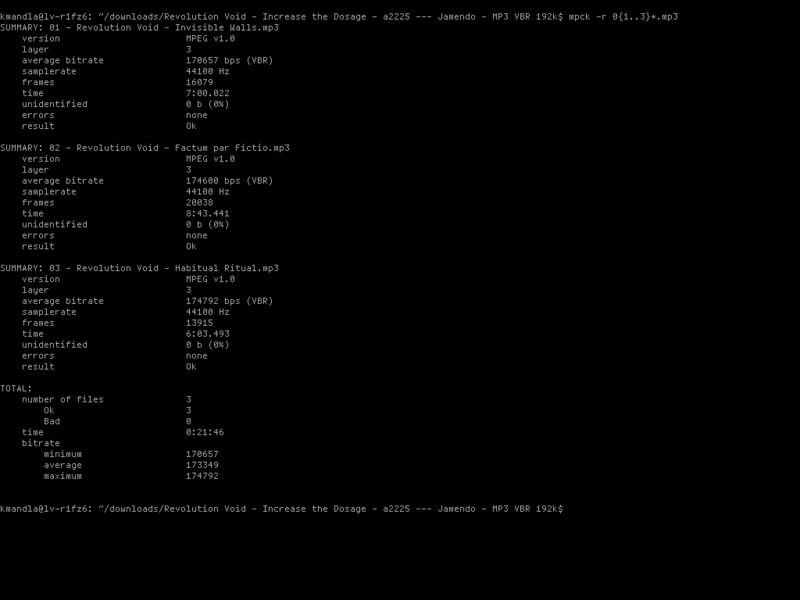 A tool specifically for carving away at mpeg files of all varieties is not intimidating in itself. Knowing full well that it’s a console-only tool, with nothing graphical aside from specific control characters … that might be daunting to some. mpgtx wisely subordinates some obvious functions to quick mnemonics, taking its biggest functions and relegating them to ancillary “programs.” So mpgtx -s is the same is mpgsplit, and so forth. I mention that only because I enjoy little conveniences like those. Once you get used to how mpgtx represents ranges and times, it becomes a piece of cake to get it to split or join as you like. 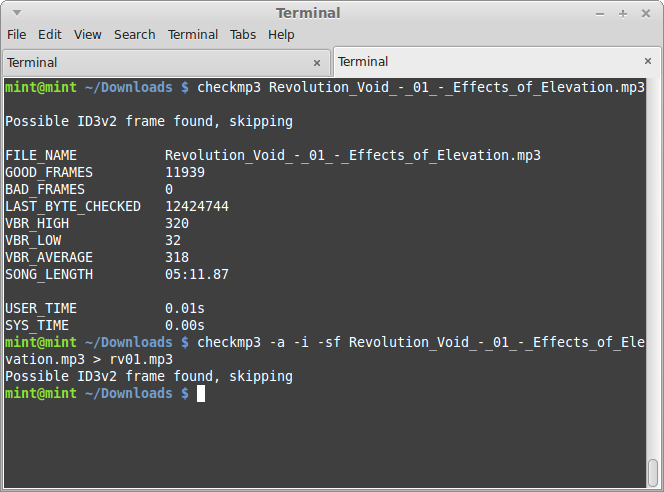 Knowing some of the mechanics of a video file are important too though. I had a lot of false starts with split video files until I used the -P flag, to preserve the metadata between the original and the chunk output. 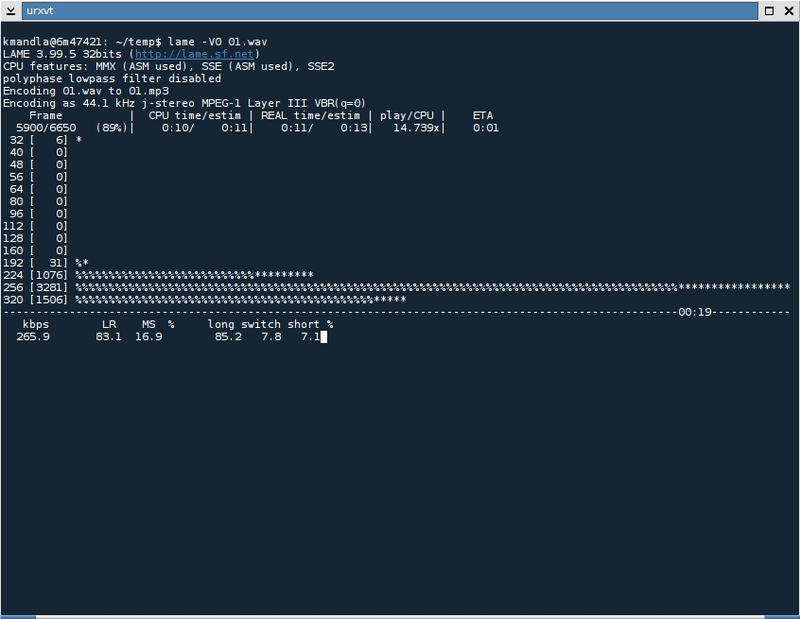 Of course, it’s not quite correct, but it helps get playback started. mpgtx claims it can handle mp3 files too, and tagmp3 — supposedly the same as mpgtx -T — has a lot of the same functions as in mp3rename and similar tools. One final note: I feel somehow obligated to mention that the last posted update to mpgtx was in 2005. Ordinarily I don’t mind if a program is out of date, even if it stretches back to the late 1980s. Part of me wonders how well this is keeping up with newer file types and media standards, and if that would be an issue with more recently encoded files. Take care and keep backups, would be my advice. Not to be a scaremonger, just that prudence is the better part of valor. This entry was posted in Linux and tagged audio, edit, file, join, movie, mp3, mpeg, mpg, music, split, video on 2014/01/25 by K.Mandla. 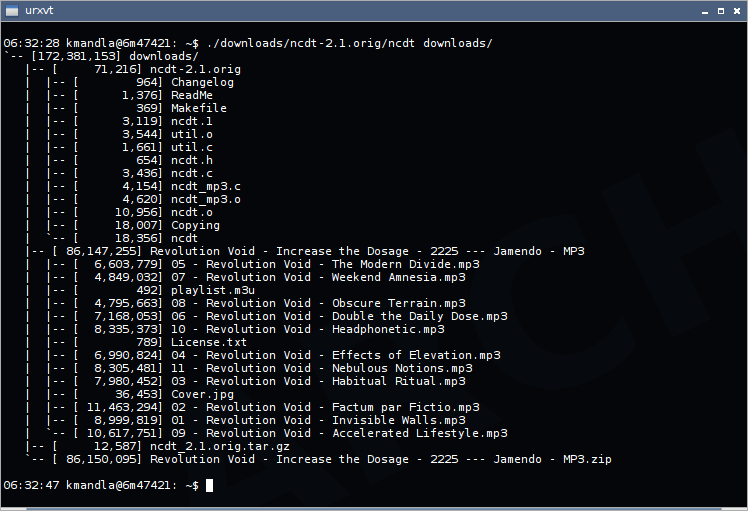 So long as we’re on mp3 file checkers, mpck is available too. Had it been me, I would have named it mp3ck, but that is neither here nor there. In the same sort of fashion as mp3check and mp3val, mpck skims mp3 files and checks for errors. And again, without a damaged file I don’t know what I can show except happy results. mpck does have a couple of unusual flairs though: It will check for names that are longer than a certain limit, check for “strange” characters, and check files with extensions other than just mp3. I see no option to fix files though, so it may be that you need another tool for a monkey wrench, if mpck throws errors. This entry was posted in Linux and tagged audio, check, file, fix, mp3, music, validate on 2014/01/24 by K.Mandla. I’m coming to grips with the fact that my Thursdays are more or less overloaded, and if I want to keep up my two-a-day pace I’m going to have to make preparations. Fair enough. Here’s one I anticipated yesterday: mp3val. Much like mp3check from last week, mp3val runs through the files you give it, and checks over the guts. 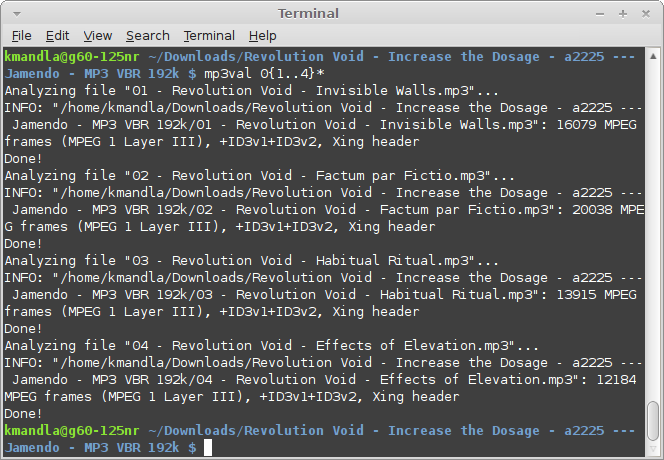 mp3val has the options to fix errors, preserve timestamps, keep an error log, etc. It seems quite prepared to do a thorough job. I say “seems” again because I went through the mp3 files I have and didn’t get any errors, like you see in the screenshot. mp3check though, marked those with small inconsistencies, which now makes me wonder if one or both of these programs is slightly out of whack. One is giving warnings, the other says remain calm, all is well.